Fact: people love free stuff. Another fact: a well-designed and executed social media contest or sweepstakes can grow your business and capture customer attention with little overhead cost. Do you remember the last time you were excited to win something? Maybe it was a limited-edition action figure in a raffle, a once-in-a-lifetime opportunity at a silent auction, or even a gift card for excelling at work. A social media giveaway can give those same feelings to your audience while creating an engaged customer base. Each social media platform has their own Terms of Service that overview the rules and regulations of conducting contests or promotions. Conforming to their guidelines is essential to launching your contest. S.M.A.R.T. (specific, measurable, attainable, realistic, and timely) goals will help to clearly define what your contest is about before you launch. Think about what you want your goals to be--perhaps increasing engagement or growing your email list -and then solidify them so you can look back after the contest is over. You’ll want to have your own set of rules and determinations to protect your company and its reputation. Selecting how the winner will be chosen, who can enter, as well as your company’s reserved rights are all necessary. Not to burst any bubbles, but few people are going to sincerely engage with you if you’re offering out $10 bills as prizes. Think about prizes that are relevant to your company. For example, limited edition products, travel prizes, gift cards, or unique experiences are all better than a piece of paper, even if it is currency. Like we said in our 2017 marketing trends blog, influencers are crucial in today’s social media strategy. 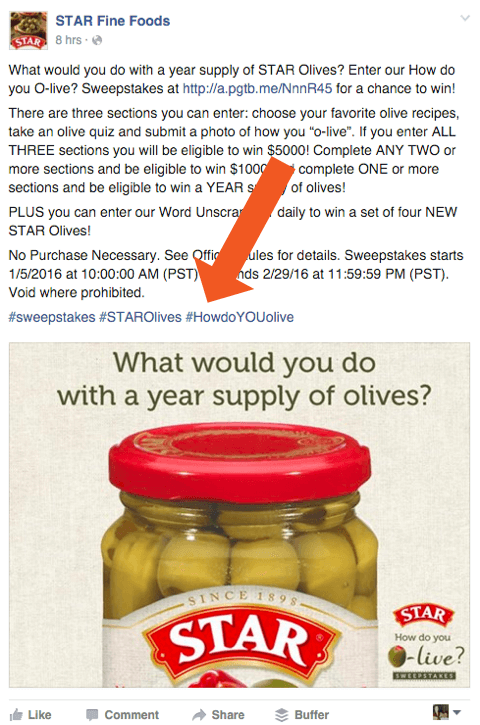 Social media contests are no different. Social influencers can be great advocates that allow you to reach new audiences and develop brand trust. If people can’t find your giveaway easily, you won’t get impressive results. Posting at least once a day during your contest can help get your message out there. Everyone likes a #CustomizedHashtag, right? Have fun with this, but make sure the hashtag is relevant to your brand and conveys the message you want to send about your social contest. Here’s a good example. If you want to know what went well–or how to correct what didn’t go well–measure your contest’s impact. Conversions, click-through rates, and engagement are just a few ways to measure your sweepstake success. No one wants to deal with a debacle, but if you’re in one, having a social media crisis plan will certainly help. If you don’t have a crisis plan already, it’s best to cement your plan before you do any contests or giveaways. If you're interested in more general advice about your social media strategy, check out our introduction to social media marketing! Thinking about upping your social media game? We’re an inbound marketing agency that has experience rolling out social media campaigns and contests. Contact us today.